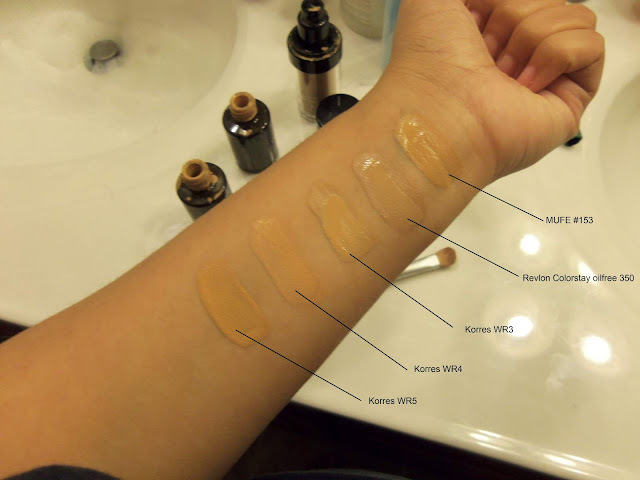 I had a friend of the blog asked me about some makeup I mentioned earlier this year, and so I swatched them for her, then I figured someone else might looking for the same info, so here they are. In MAC Studio Fix Powder I am C4, but I have never found one of their foundations that matched me, all of their liquids oxidize on my skin and turn peachy. With Winter Skin -__- Korres WR3 and Revlon ColorStay Oil free are the best matches on my face, spring moves me into Korres WR4 but once summer moves in, MUFE 153 and Korres WR5 come out to play :) Yes, they joy of tanning easily is also the joy of owning at least 5 foundations in the course of a year. Hi Bianca, I recently found your blog and enjoy reading it/seeing your outfits...I had to make a comment about this foundation post. I understand you may not want to share/approve it to your audience, but I thought you would find the information helpful. I am a beauty consultant with Mary Kay and know the frustration it takes to find the right foundation for each woman...you are certainly right, most women need a "winter" shade and a "summer" shade, though it sounds like you change even more frequently than that! I do hope when you try foundations, that you match them to your face, from your cheek to your jaw. I think you just used your arm here to show the difference between the 5, not how they match to you; am I right? Also have you ever had your foundation color matched with a Mary Kay beauty consultant? I am in Chicagoland, so I'm not sure I could personally help you, but if you check out marykay.com and put in your zip code, I bet you would find a knowledgeable, friendly consultant who would be willing to come to you. With over 70 shades between 6 formulas, there's bound to be a perfect foundation for you. I love pampering my customers, providing excellent customer service, and a 100% satisfaction guarantee. All this with an amazing product...you really should check us out! How cool is it that I found this post today? I've been thinking about finally trying MUFE HD foundation. I'm heading to Sephora today!